Guido Reni (1575–1642), The Conversion of Saul (c 1615-1620), oil on canvas, 238 x 179 cm, Monasterio de San Lorenzo, El Escorial, Spain. Wikimedia Commons. 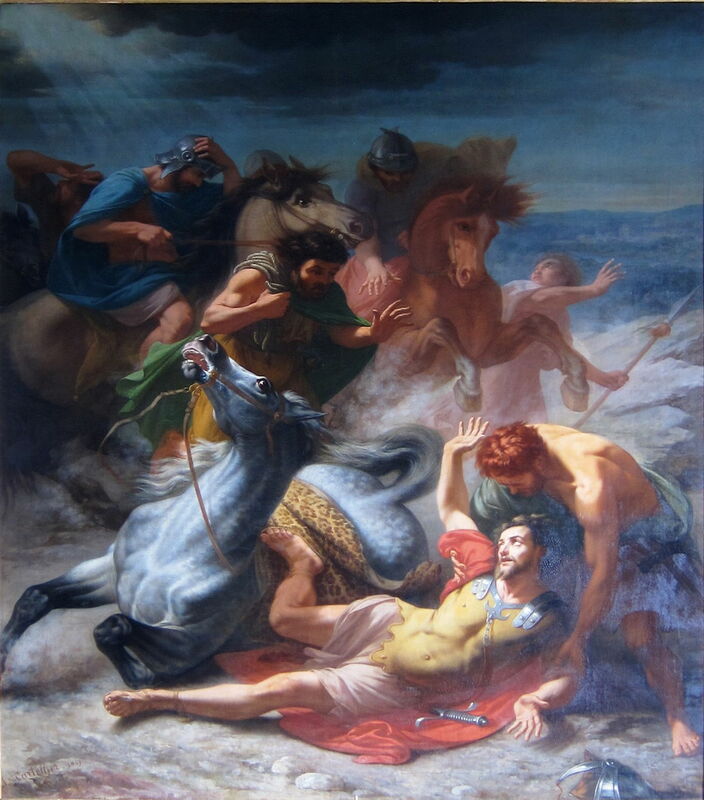 I recently praised Domenico Morelli’s superior composition in his The Conversion of Saint Paul (1876). This article explores earlier paintings of this popular story from the New Testament, to see how the previous Masters had tackled it, and whether my claim is justifiable. I regret that there is one important painting of this story which I am unable to show here: one of the several versions painted by Sir Peter Paul Rubens (1577-1640), such as that in the Courtauld Gallery, London. This is because non-commercial use of images of that work, and at least one other Rubens in Austria, is not permitted under a standard CC or similar licence. Images of that work are therefore omitted from Wikipedia and Wikimedia Commons, etc. According to chapter 9 of the Acts of the Apostles, Saint Paul – then known as Saul – was a zealous Pharisee who was engaged in the intense persecution of early followers of Jesus Christ. In around 33-36 CE, when he was on his way from Jerusalem to Damascus in Syria, on a mission of persecution, he experienced a blinding light and the voice of Jesus, asking why he persecuted him. Saul first fell to the ground, then converted, becoming Saint Paul, one of the founding fathers of the early Christian church. For three days after he saw the blinding light, he remained blind, and did not eat or drink, but his sight was restored when he visited Ananias of Damascus. As with the story of the judgement of Solomon, there would only appear to be one moment which can be depicted in a single narrative painting: the climax and peripeteia, in which Saul/Paul sees the blinding light and hears the heavenly voice. A few paintings do not show that moment, but the rather weaker narrative of Paul’s sight being restored by Ananias in Damascus. The compositional problem is that for Paul’s face to be clearly visible, it must be turned towards the viewer. However, for it to be illuminated by the heavenly light at that moment, that light would have to fall from behind the viewer, which makes it very difficult to show as a heavenly light, as its origin will be virtual. Solving that appears to be one of the important problems posed of the painter. Parmigianino (Girolamo Francesco Maria Mazzola) (1503–1540), The Conversion of Saint Paul (1525-7), oil on canvas, 177.5 x 128.5 cm, Kunsthistorisches Museum, Vienna, Austria. Wikimedia Commons. 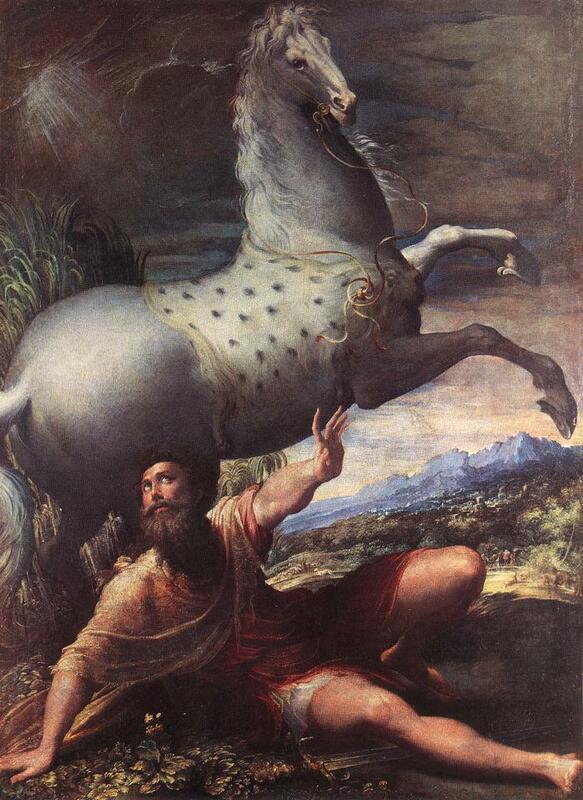 Parmigianino’s The Conversion of Saint Paul (1525-7) shows Paul on the ground, having been thrown from his horse, looking up to the top of the painting, and holding his left arm and hand out as if he can no longer see. His facial expression shows surprise, but the only heavenly light seen is that at the upper left of the painting, which does not match the shadows either. Parmigianino fills much of the image with the rearing horse, which heightens the moment of drama. Although there are clearly issues with his depiction of the heavenly light, and Paul’s companions are nowhere to be seen, this is a powerful account of the story. References to the past are essentially absent, and the even more difficult task of making reference to Paul’s future is also avoided. 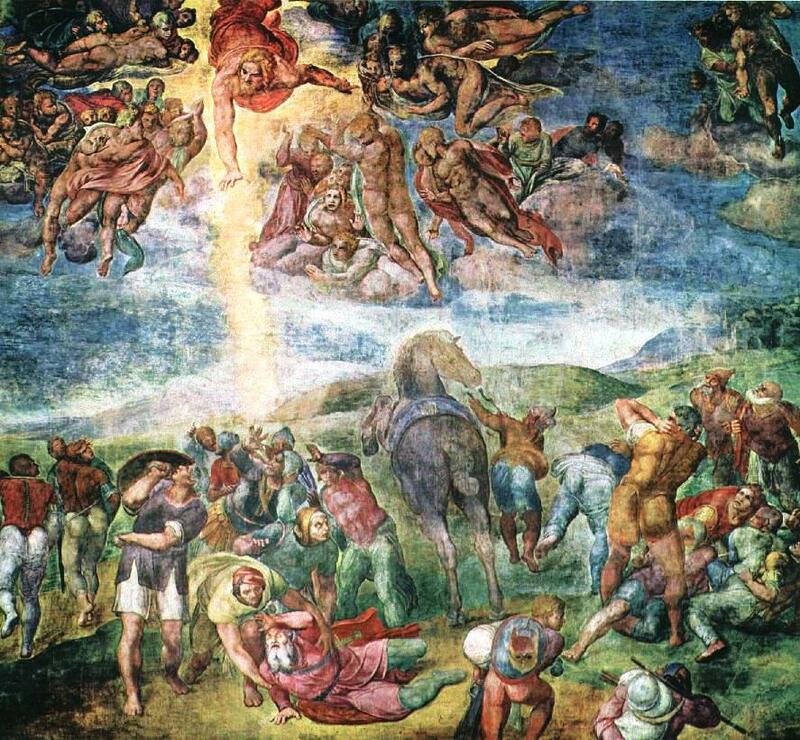 Michelangelo Buonarroti (1475–1564), The Conversion of Saul (c 1542-5), fresco, 625 cm × 661 cm, Cappella Paolina, Vatican Palace, Vatican City. Wikimedia Commons. Michelangelo’s The Conversion of Saul (c 1542-5) has a confusion of figures, from which Paul only gradually becomes clear, on the ground in the centre of the lower edge of the fresco. Here, Paul is an old bearded man, clearly blinded by the heavenly light, and has also fallen off his horse, which is still rearing just below the centre. The snag is that the heavenly light – shown particularly clearly – comes from the figure of Jesus at the top. In the Biblical account, Paul’s companions can neither see the blinding light nor hear the voice which Paul can; Michelangelo departs from that, with many in the party looking up to the heavens, and a couple even holding their arms up as if to shield themselves, in the way that Paul does with his left arm. The role of the other figures shown in the heavens is also a mystery to me. Lucas Cranach the Younger (1515–1586), The Conversion of Saul (1549), painting on lime, 115 × 167.2 cm, Germanisches Nationalmuseum, Nürnberg, Germany. Wikimedia Commons. 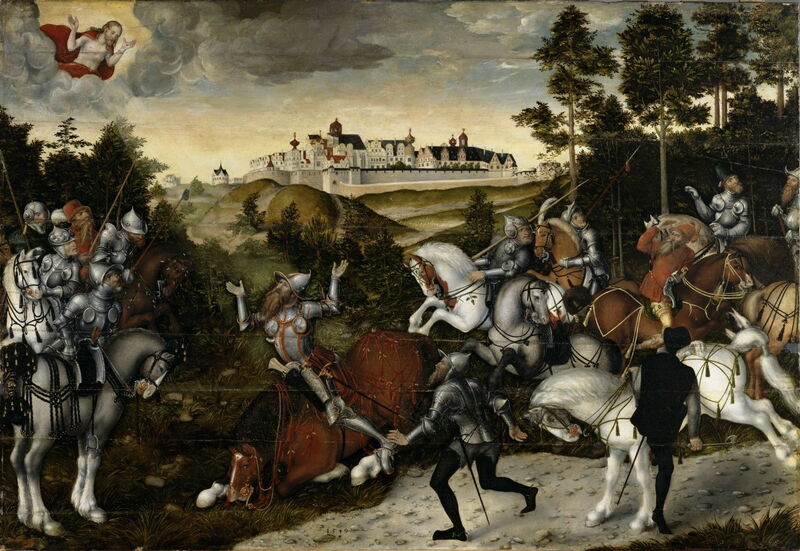 Lucas Cranach the Younger sets his The Conversion of Saul (1549) in mediaeval northern Europe, with Paul and his party riding knightly chargers in their armour. Paul’s horse has fallen to the ground, with Paul still in the saddle – and not prostrate on the ground. Paul holds his hands up and looks to the heavens, where the figure of Christ is seen in a break in the clouds at the top left corner. It is possible that the overpainted shaft of light from there has faded over the centuries. 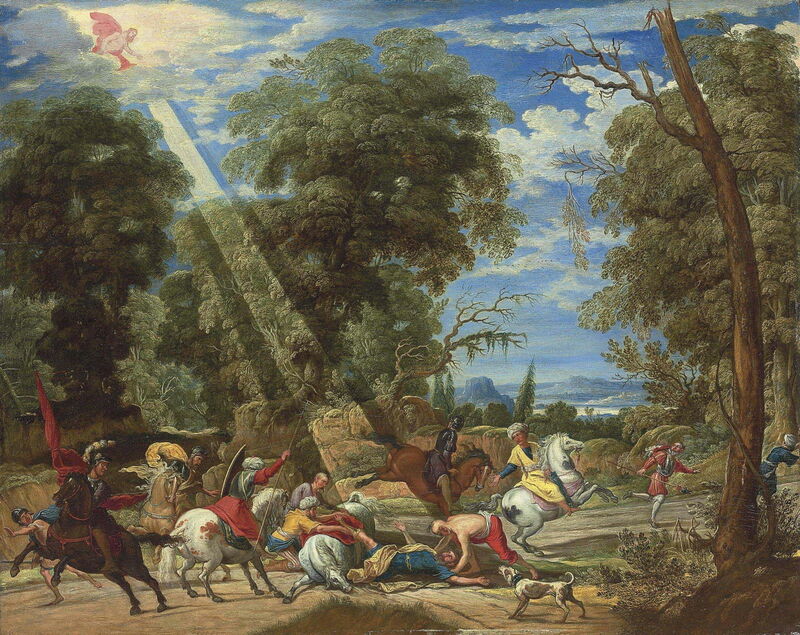 Adam Elsheimer (1578–1610), The Conversion of Saint Paul (c 1598), oil on copper, 19.6 × 24.9 cm, Städelsches Kunstinstitut und Städtische Galerie, Frankfurt, Germany. Wikimedia Commons. Adam Elsheimer’s small The Conversion of Saint Paul (c 1598) painted, as usual, on copper, is an original composition which shows the outcome of a mediaeval skirmish, with all the horses in trouble, and Paul’s mount stretched out on its back in severe distress. Although he does line Paul’s face up with the heavenly light at the top of the painting, that occludes his face almost completely, and it is hard to guess which of the figures is Paul. Although this is the first attempt to align the light and Paul’s eyes in accordance with physics, it demonstrates the problems that arise in doing so. Pieter Bruegel the Elder (1526/30–1569), The Conversion of Paul (1567), oil on panel, 108 × 156 cm, Kunsthistorisches Museum, Vienna, Austria. Wikimedia Commons. 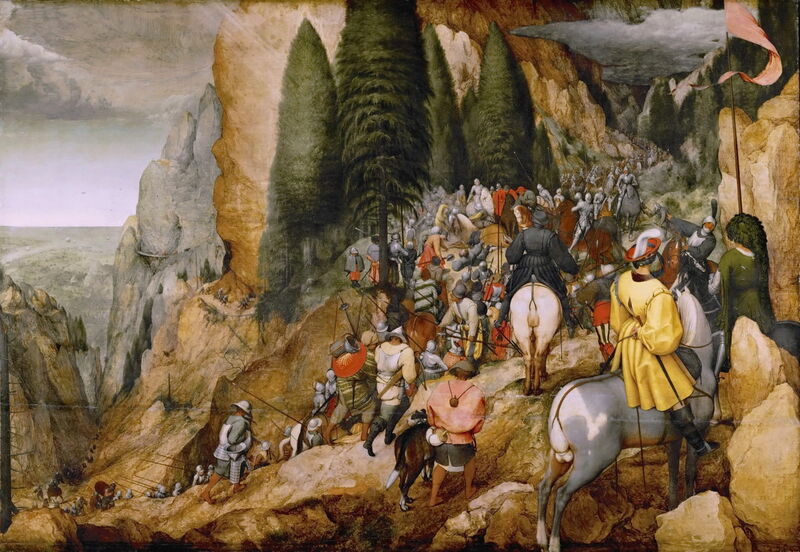 Pieter Bruegel the Elder takes the setting of his The Conversion of Paul (1567) to an Alpine pass, with spectacular scenery for a seriously challenging road to Damascus. Unfortunately Paul is lost in the dense column of soldiers, knights, and other travellers who are struggling up the vertiginous route. He may be just to the right and above the centre of the painting, but is harder to make out than the shaft of light which falls from the heavens. 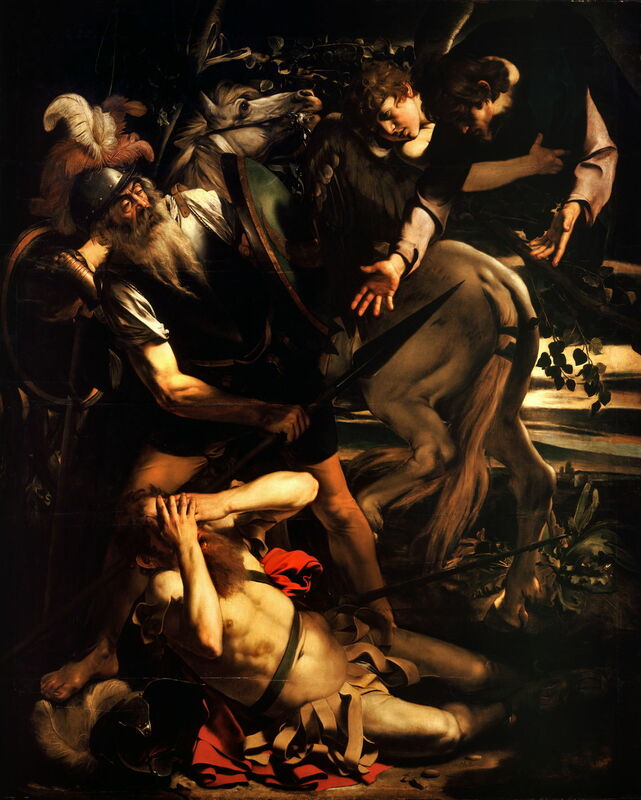 Caravaggio (Michelangelo Merisi da Caravaggio) (1571–1610), The Conversion of Saint Paul (1600), oil on cypress wood, 237 x 189 cm, Odescalchi Balbi Collection, Rome. Wikimedia Commons. Caravaggio’s The Conversion of Saint Paul (1600) heads in the opposite direction: here is a small, intertwined group struggling in impenetrable blackness. Paul reclines on the ground at the front, both hands covering his face, his body language more than making up for the absence of facial expression. Behind him horses have become spooked, and arms are held out to help Paul back up to his feet. The light from which Paul is shielding his eyes is clearly coming from the sky, but we are not shown its heavenly origin. Caravaggio (Michelangelo Merisi da Caravaggio) (1571–1610), Conversion on the Way to Damascus (1600-01), oil on canvas, 175 x 230 cm, Cappella Cerasi, Santa Maria del Popolo, Rome. Wikimedia Commons. Caravaggio’s second version uses a similarly-dressed figure for Paul, but otherwise is very different. In his Conversion on the Way to Damascus (1600-01), Paul lies back, eyes closed, arms held up to the heavens. His horse stands more peacefully, its bridle held by another in the party. Although fine and detailed studies of the figures, both his paintings neglect the narrative. Guido Reni’s The Conversion of Saul (c 1615-1620) refers to Parmigianino’s painting of almost a century earlier, although it employs a different composition. Paul has just been thrown from his horse, who remains in distress with its head raised towards the bright light in a break in the clouds. Paul is in clear disarray, but gives not a clue that he is in blinding light, and with his face turned partly towards the apparent source, it isn’t even possible to see whether his eyes are closed. His arms do not shield his eyes, though. David Teniers the Elder (1582–1649), The Conversion of Saint Paul (date not known), oil on panel, 51.4 × 63.7 cm, Private collection. Wikimedia Commons. David Teniers the Elder puts the figures and action in the lower quarter of a finely-painted landscape with trees. 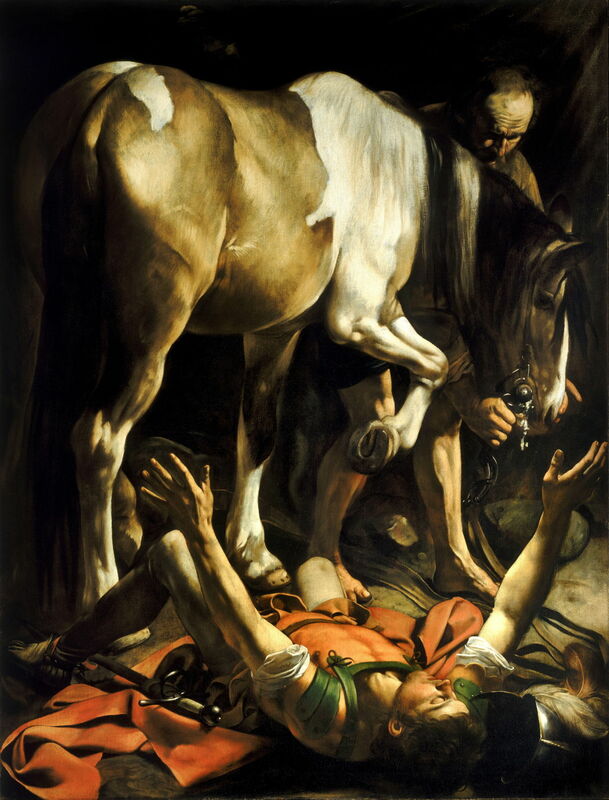 His The Conversion of Saint Paul still manages to tell much of the story, though. Paul, dressed in blue, rests on his back, his right leg still up on the saddle of his fallen horse. He stares at the shaft of light falling from Jesus Christ in the top left corner. One of the party is trying to help Paul back up, while others attend from the left of his horse. As Elsheimer did, Teniers shows more general disarray among the horses, with three others (one of which is being ridden by a passing soldier) affected. However there are no clear references to the past or future in the painting. Teniers has solved the compositional problem, but at the cost of making the figures smaller and more distant, which loses some of the drama and impact which could have been achieved from closer in. Luca Giordano (1632–1705), The Conversion of Saint Paul (c 1690), media and dimensions not known, Musée des Beaux-Arts, Nancy, France. Wikimedia Commons. 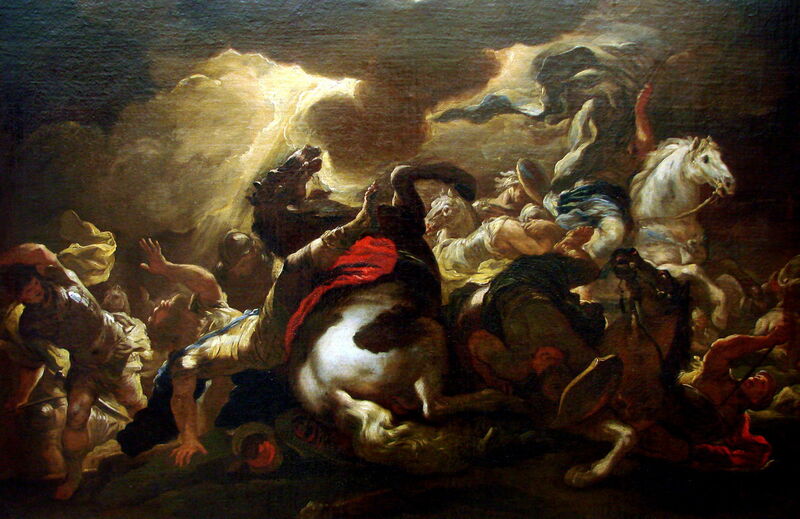 Luca Giordano’s The Conversion of Saint Paul (c 1690) shows total mayhem. 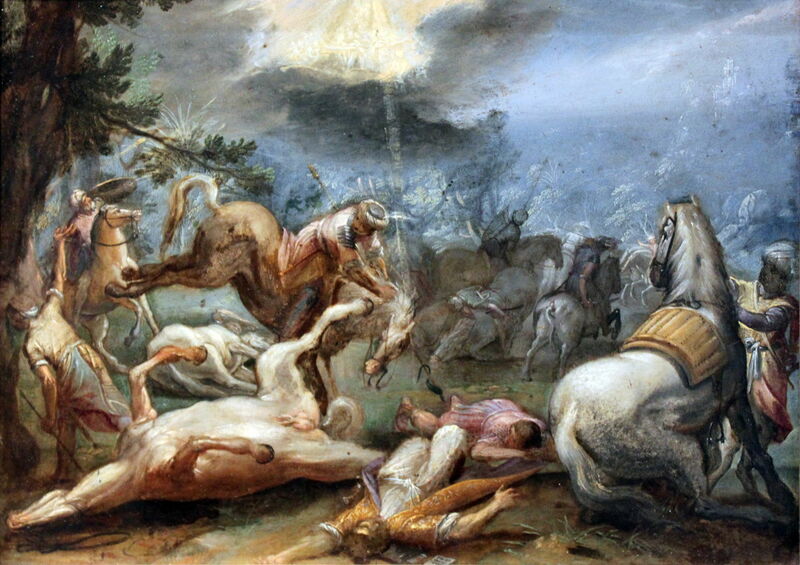 A truly blinding light falls from heaven as Paul’s horse rears and falls violently. Paul holds his left hand up to shield his eyes, but his face is barely visible. Around him, the other horses and their riders are either on the ground already, or their mounts are bolting. That brilliant light sets all in sharp relief against the black shadows. Another powerful painting, it works around the problem of not showing Paul’s face with its strong body language and lighting, and succeeds in telling the story, although as with the other works it lacks a past or future. Jérôme Cartellier (1813-1892), The Conversion of Saint Paul (1859), media and dimensions not known, l’Église Saint-Pierre Saint-Paul, Lille, France. Wikimedia Commons. Jérôme Cartellier’s The Conversion of Saint Paul (1859) is almost as full of action. Paul’s horse has fallen, and the rider lies on the ground, staring up at the brilliant light. The rest of the party is trying to regain control of their own mounts, and reach Paul to help him. Although Cartellier’s composition almost finds the right compromise, Paul is clearly looking up at a light which is on the viewer’s side of the picture plane, and the shafts shown at the top left corner do not quite coincide. Domenico Morelli’s The Conversion of Saint Paul (1876) tries a novel solution, which I think works best of all. Accepting the contradictory requirements, he puts Paul in the brilliant light, showing its origin in the heavens, but has him face away from it. Now blinded by that light, Paul looks – with clearly unseeing eyes – towards the viewer, his right arm and hand outstretched. Another impressive detail is that the rest of the party are looking in different directions, making it clear that they are unable to identify the origins of Paul’s distress. Then there is the matter of clues to the past and future. Morelli even accounts for those in the scroll at the bottom left corner, which might contain details of the Christians who he seeks to persecute in Damascus, and is a reference to his future epistles and other writings for the Christian Church. All without the complications, and potential controversy, of any horses. Posted in General, Painting and tagged Brueghel, Caravaggio, Cartellier, Cranach, Elsheimer, Giordano, Michelangelo, Morelli, narrative, painting, Parmigianino, Reni, Teniers. Bookmark the permalink. These paintings were all fascinating. St. Paul is certainly one of the best examples of God’s ability and work of changing bad to good. Thank you. I’m delighted that you enjoyed them.